LOOMING over the San Ramon Valley is area’s dominant physical feature, Mount Diablo – the Devil Mountain. No name in the Bay Area has as interesting and imaginative a history as that of Monte Diablo. This column will be first of several which will examine the facts and fancies about the mountain and its name. Diablo is not a volcano, contrary to some early historical speculations, but is sort of a “geologic freak.” As described by Oliver Bowen in the Geologic Guidebook of the San Francisco Bay Counties: “The core of the twin-peaked mountain consists of jumbled massive rocks of the Franciscan formation which literally have been punched through the once overlying Cretaceous and Miocene formations from below.” It was formed in close to its present configuration about 10 million years ago in the late Cenozoic age. Since it stands alone at a height of 3,849 feet above sea level, it can provides a view which is extraordinary. Yosemite’s Half Dome, Mount Lassen and the Farallones can all be seen on a clear day from the summit. The Spanish probably first saw the mountain in 1770 and actually first stepped on its foothills in 1772. The 1772 expedition, headed by Lt. Pedro Fages and recorded by diarist Padre Juan Crespi, was the first Spanish trip through the San Ramon Valley as well. The first real geologic investigation of the Bay Area included a measurement of the mountain. This mapping was done by Englishmen from the ship “Blossom” who sailed into the Bay on Nov. 6, 1826. Capt. Frederick W. Beechey asked the acting presidio commandante, Ignacio Martinez, for permission to map the Bay. With that permission and the requirement that a copy of the chart be made for Martinez, three men spent 54 days mapping the bays of San Francisco and San Pablo and most of the Carquinez Strait… The mountain appears on their map with the name “Sierra Bolbones” at a measurement of 3,770 feet high. Historians think that the men climbed the mountain and measured it with a mercurial barometer. 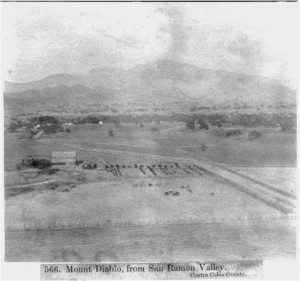 Because of the immensity of the view shed, the summit was established by Col. Leander Ransome in 1851 as the initial point of the Mount Diablo Base Line and Meridian. From this point, about two-thirds of California and all of Nevada are measured. The Indians of Northern California were the first people to live within sight of the mountain. To them it was sacred. The next Valley Vignette will discuss the Indian perspective. Resources: F. W. Beechey, Narrative of a Voyage to the Pacific and Beerings’ Strait, 1831; Henry Bolton, Fray Juan Crespi, Missionary Explorer on the Pacific Coast; Oliver Bowen and V. L. Vanderhoof in Geologic Guidebook of the SF Bay Counties, 1951; Beverly Ortiz, personal communication; Randall Milliken, An ethnographic study of the Clayton area, Keller Ranch cultural resource evaluation, 1982.